I've got an exciting weekend of baking ahead, but I still have a recipe that I tried out last weekend to report on, so here's the starter before the main event! Whiskey connoisseur I am not. Fortunately, my husband is (learning to be one)! Rather, I should say that this recipe appealed to me at all because I knew that it would appeal to him, though that's not to say that any baking would normally go astray... In any case, since whiskey is not my drop of choice, I thought that if anything could make it palatable to me, it's chocolate! 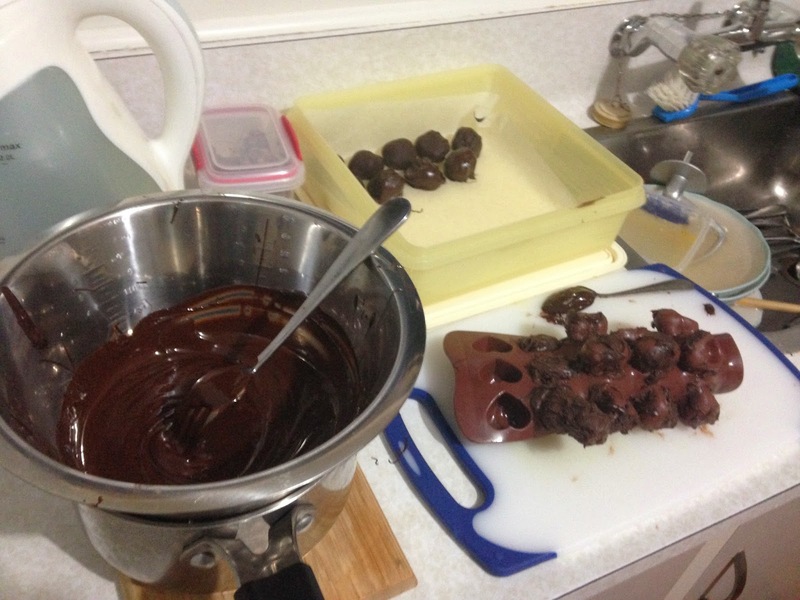 And who better to provide that choco-droppo fix than Jo Seagar, New Zealand's answer to Betty Crocker. A familiar face to the NZ public for her cookery prowess, Jo and her husband have set up a cafe and cook store in rural North Canterbury which one day I hope to visit as it's not too far from Christchurch. They also run a cooking school and have released a recipe book from it (naturally entitled, 'The Cook School Recipes') which I have got my hot little hands on! 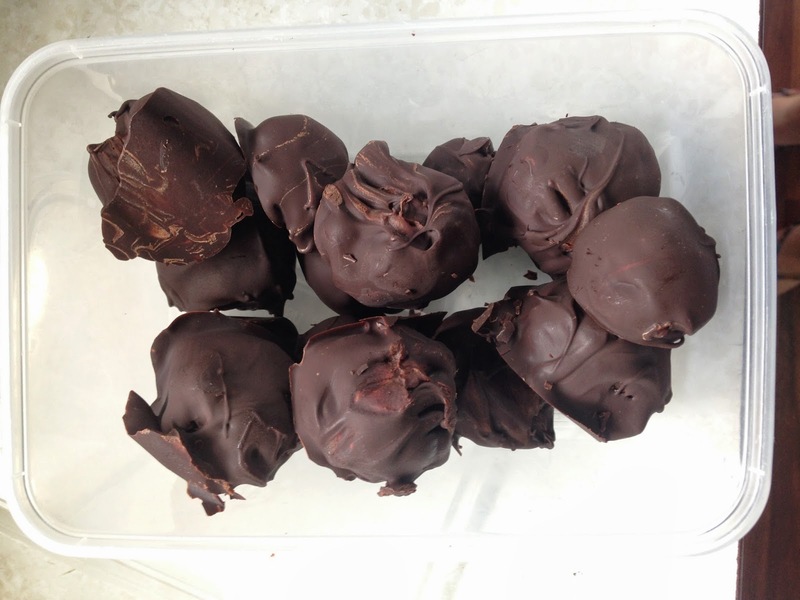 Jo's recipe for whiskey truffles is the second I have tried from the book but there are many other delicious-looking morsels I intend to replicate. The original recipe suggests using chocolate melts/baking buttons as the entire chocolate component, however I find that even the dark choc kind can be too sweet on their own. Instead, I used semi-sweet chocolate (Whittakers Dark Ghana, mmmmm...) to coat the truffles with, keeping the dark choc buttons as part of the inner truffle mixture. Nathan had no complaints, which is good enough for me! Approx. 300g (one and a bit blocks) semi-sweet dark chocolate, or bitter-sweet if you prefer it. Place the baking buttons, cream and whiskey in a small saucepan and stir gently over a low heat as the chocolate melts. 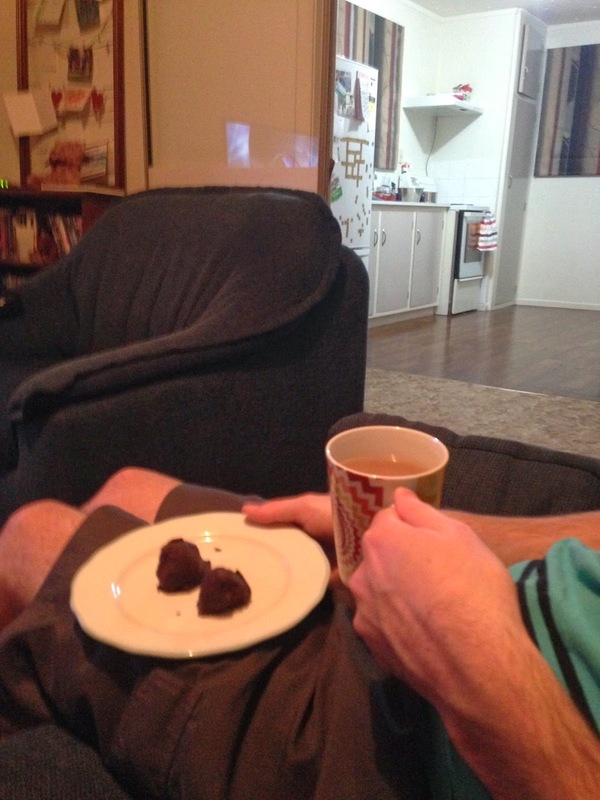 I waited until the chocolate was almost all melted before adding the cream and whiskey. Stir until well combined then remove from heat and chill saucepan with the chocolate mixture still in it, in the fridge - I recommend an hour or longer if you can. Once removed from the fridge, roll the mixture into balls the size of large marbles, using two teaspoons if it helps. 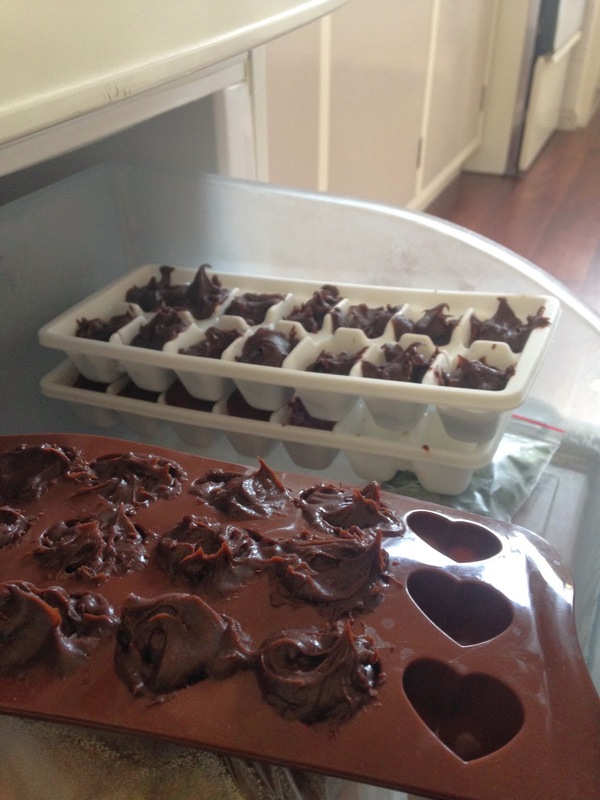 I found that the mixture was still too soft for this, so I filled an ice cube tray and a chocolate mould. Freeze for at least an hour until firm. When I removed the truffles from the ice cube tray and mould, I found they needed to be rolled into a proper ball shape but were firm enough to hold this shape. Heat the semi-sweet dark chocolate in a small metal bowl sitting over/inside a saucepan (this is called a bain marie - if you are careful to use a really low heat, you should be able to get away with heating the chocolate directly in the saucepan, but be careful not to burn it!). Once the chocolate is melted and smooth, remove it from the heat. 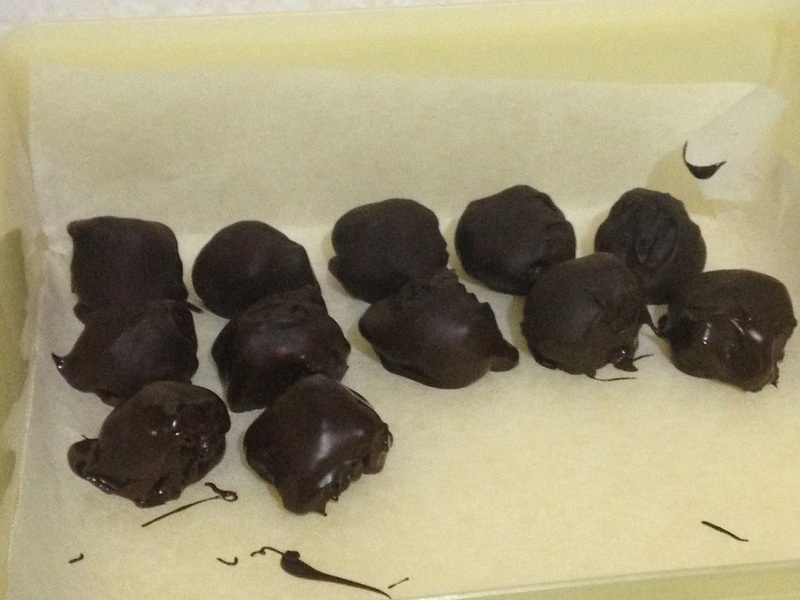 Use a fork and spoon to dip each frozen truffle in chocolate and then place them on a sheet of baking paper to set. Yes, that is the water jug and the sink in the same photo - I have a TINY kitchen!! Welcome - to you and me!